And How To Thrive In The Real Estate Market’s Newest Sensation! If you are a qualified real estate professional as listed below and you want to find out how to grow your business via opportunity zones this FREE brunch event is for you. Space is limited and will be first come first serve as far as reservations. The BLUEzy brunch series presented by Justin Wolk of StackSource. Hosted locally in Charlotte, North Carolina by Leigh Brown of Leigh Brown & Associates, RE/MAX Executive. 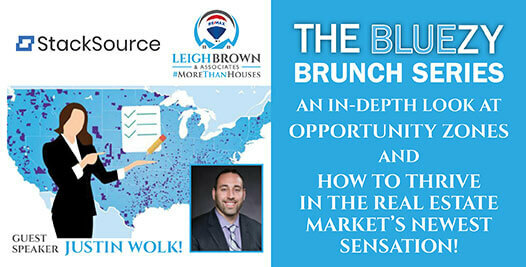 Join us at the The Westin Charlotte on Tuesday, April 9th from 11 am to 1 pm for a complimentary brunch and learn from an Opportunity Zone expert Justin Wolk of StackSource. If you have not registered yet, our final spots are filling up fast!